There are many, many old movies that I absolutely love, and then there are others that I like just as much in their own way for being interesting, inspiring, or having actors/actresses I enjoy seeing. 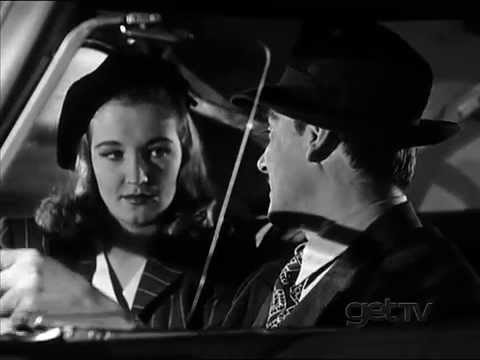 The 1945 noir film “Escape in the Fog” is one of the latter. Actress Nina Foch plays the part of a mentally battered war nurse who had a frightful dream of a future event while on leave for rest. She disturbs the hotel guests with her screams, bringing her to meet one of them – the actor William Wright, a mysterious but friendly (and handsome) double espionage agent whose future she had foreseen. Nina Foch becomes an important part to William Wright’s mission, but later she becomes a desired pawn for those w ho would seek to sabotage his efforts. I hope I didn’t give away too much of the plot here, but I find the details of this movie enthralling (the conversations, the subjects, etc. ), as it was made during war time. Although it is not as good as Marvel’s “Agent Carter”, I enjoy seeing the lovely Nina Foch take on a significant role for a woman trying to actively aid world events, besides enjoying her alongside William Wright, to me one of the most dashing and little known Hollywood men of WWII times (next to John Hodiak). What this chatter amounts to for this post is the fact that I made a suit set inspired by the fashion on the “Escape in the Fog” movie. It all started with finding and buying a $5 vintage beret-style wool hat, really. Soon after the hat was bought, I watched “Escape in the Fog” for the first time and I saw an almost exact style hat worn on Nina Foch. 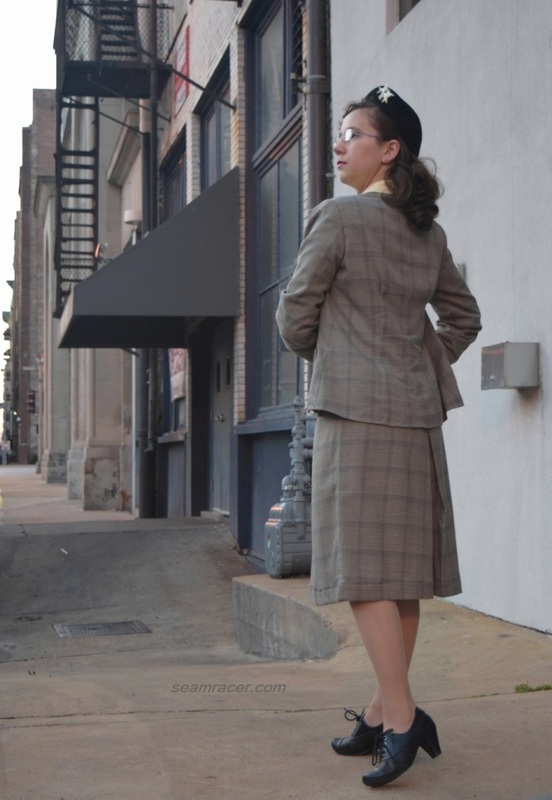 A few years back I had also made the skirt half to a 1945 suit set, and seeing all the finely tailored suits and trench coats both Wright and Foch wore in the film inspired me to finish up the coat half of my set. 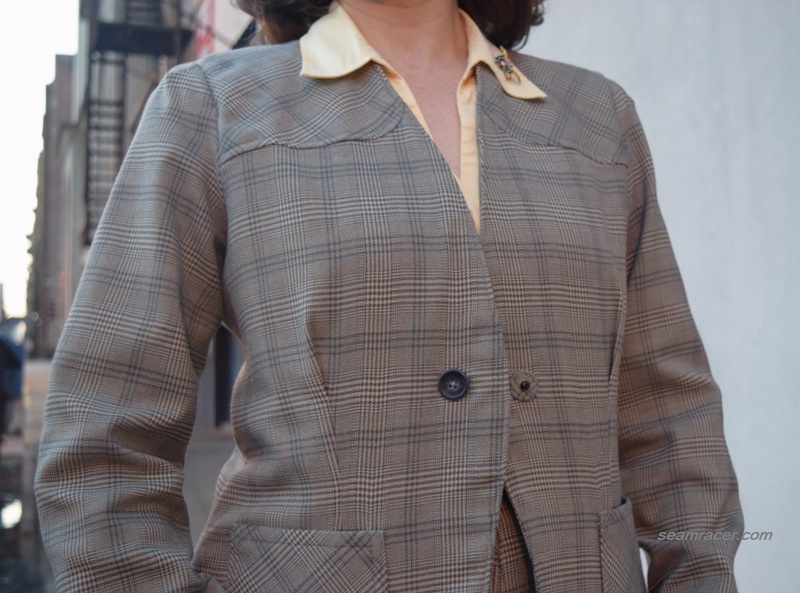 Now I have the perfect year 1945 outfit to relive “Escape in the Fog” by watching the details of life down darkened city alleys and warily wind my way home in the gathering dusk in a complimentary muted grey Glen plaid. It’s really the perfect suit for anytime, but a girl can dream, right?! FABRIC: a rayon and acrylic blend brushed Glen Plaid suiting with a grey cling-free polyester lining the coat blazer. NOTIONS: The buttons for both the skirt and blazer came from the stash of hubby’s Grandmother. 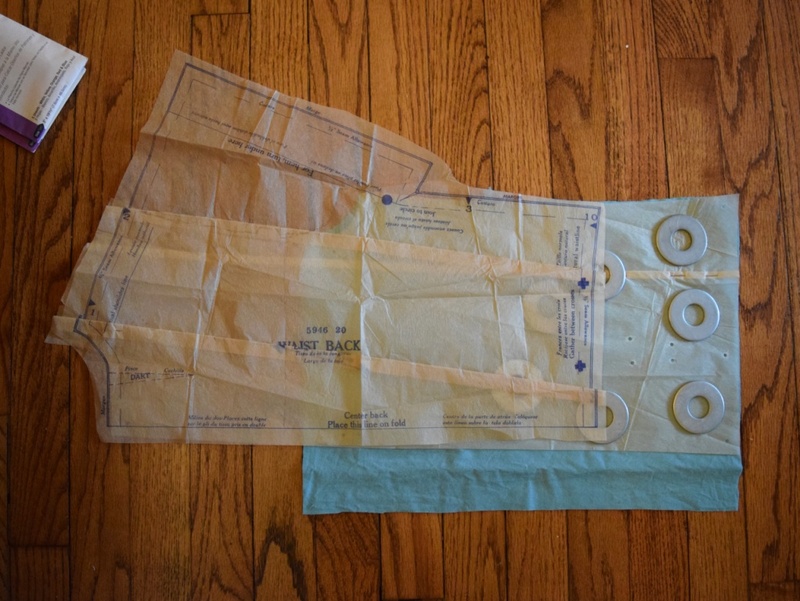 The bias tapes, interfacing, shoulder pads, and thread I used were already bought years back and on hand. TIME TO COMPLETE: The suit jacket was made in about 20 hours and finished on October 25, 2016. The skirt was made pretty much a year before, whipped up in only a few hours. 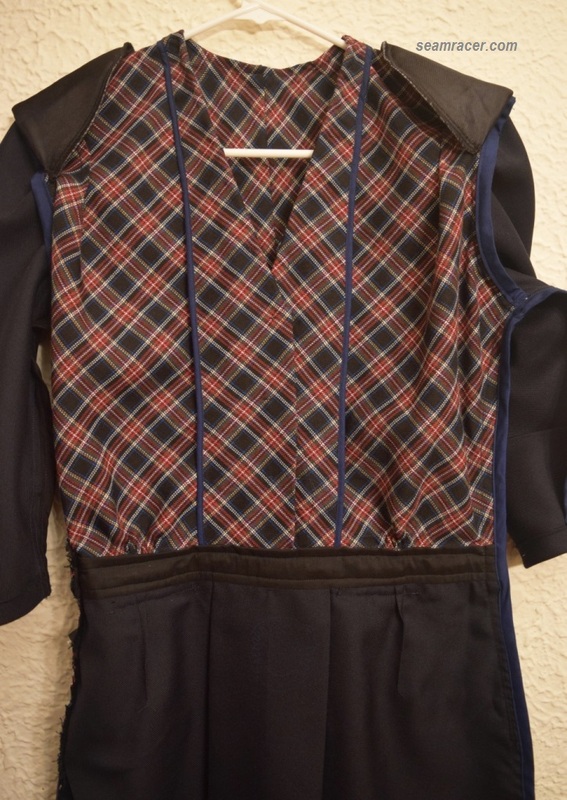 THE INSIDES: The skirt is all bias bound finished and the suit jacket is fully lined. TOTAL COST: Well, I sure stretched out only a few yards here! I only used about 2 ¼ yards for this suit – true 1940’s rationing smarts – which leaves me with about ½ yard leftover for another project! This suit set probably ended up costing me $10 because the suiting was bought on clearance from the now defunct Hancock fabrics, while everything else was from my stash on hand. Well, this suit might be vintage but it also happens to be right on trend this cold season. Suit sets are the new “thing” it seems and popular in all styles and variety (see this recent post from Simplicity)! There is a suit style out there for every body and every taste – vintage or modern! 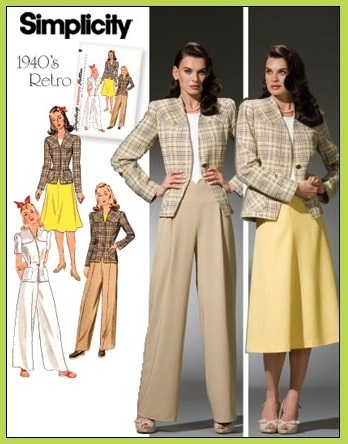 Yet, I love how 1940’s suit sets are strong but womanly, simple at first glance with details and fitting that is top rate. This suit was originally intended to be entirely made from one vintage pattern, but as my old Advance #3964 was missing significant body pieces for the suit jacket, I had to improvise and use a modern Simplicity reprint to supplement. New pattern and old pattern combined, same wonderful details with a result I love! Some of the older Simplicity reprints have disappointed me before when it comes to fit so I was wary about Simplicity #4044. I’ve already made the arch-waisted pants (blogged about here) and the skirt (yet to be blogged), and they turned out great. Thus, I had high hopes for the jacket, and I was not disappointed! 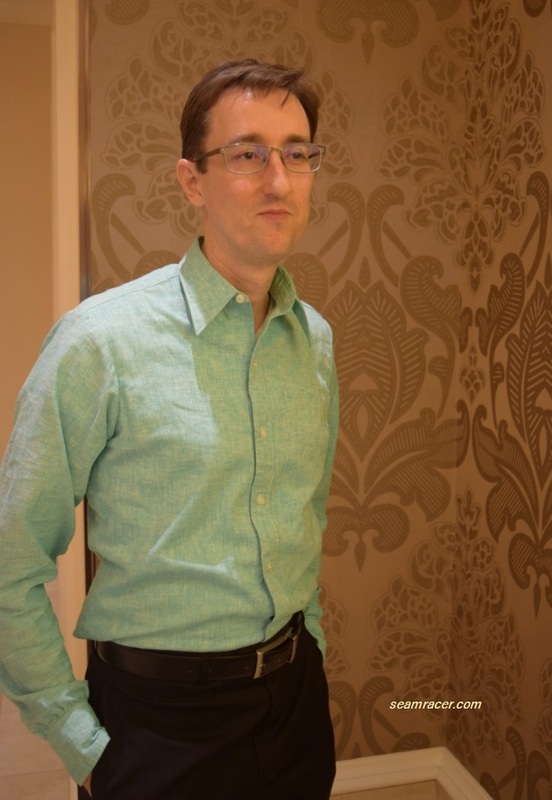 It was as easy as a suit jacket is going to get, and the fit was spot on…no bad surprises. I do miss the two piece, true suiting sleeves but the front closing and the general silhouette was strikingly similar to my old original Advance pattern’s jacket so I just had to try it out. My favorite features to the suit jackets are a combo of the pockets and the bias front shoulder panels. Look how they really make such a simple design have some character that elevates! I interfaced both of these pieces in heavy interfacing, while the front facing along the edge of the jacket opening is reinforced in a slightly lighter weight interfacing. 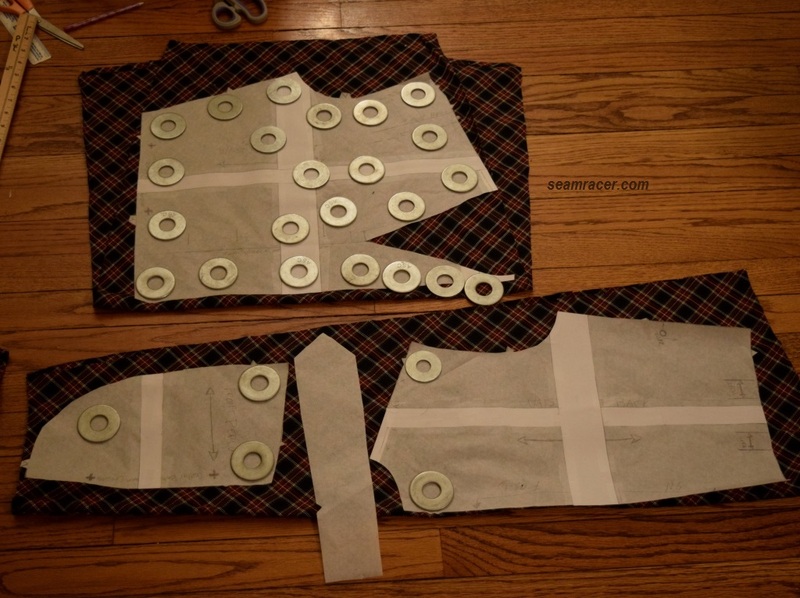 I feel this use of two different interfacing weights is a good idea for this jacket pattern. The bias shoulder pieces need to be stable to keep the strong shape of the jacket, and stiff pockets on lend a crisp, matching flawless air. The wide curving front closing edge isn’t quite supposed to be limp, nor like a poker, so something in between seems to be the right body. Yes, I did slightly cheat as to the closure and made a fake button hide the snap closing front. Sometimes when I am undecided when it comes to what button to choose for a project, I am so reluctant to make something as permanent as a buttonhole. However, I did make this snap closing very nice and use it as an opportunity to try something new! With a tiny fabric remnant, I covered the exposed half of the snap before stitching it onto the jacket. It is fun to have such lovely features as this fabric covered snap on my sewing…it makes me feel so proud of what I can accomplish, and gives me what I feel is a small taste of the amazing attention to detail and fine finishing which is on couture garments. Now my skirt was the necessary half to my finished suit but definitely the most simple and useful. 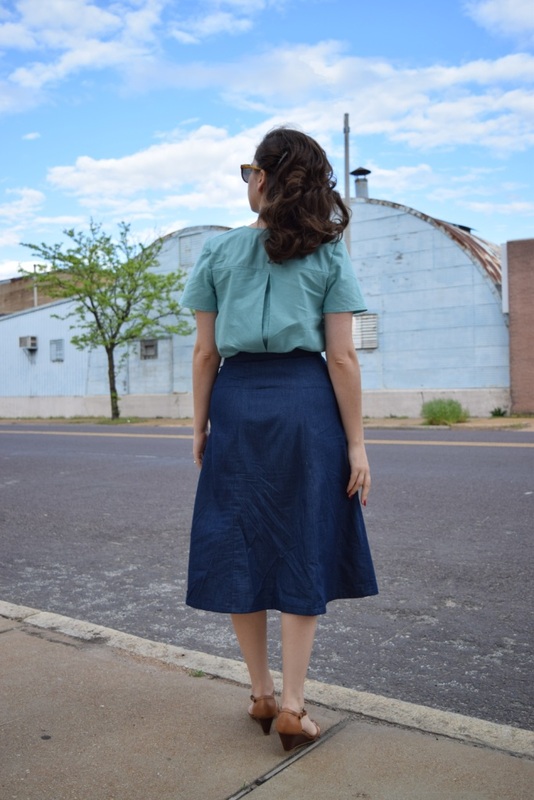 Without the matching jacket, this skirt can go with many other items in my wardrobe – navy, ivory, green, and brown blouses, tops, and sweaters as well as a true vintage forest green 40s blazer (see this set put together in this post for Emily’s Fall Color Challenge). In this post I am wearing the whole set with a creamy pastel yellow blouse (not me-made, from a resale store years back) to brighten up the set and contrast with the black accessories. With the lofty thickness of the suiting and its brushed, cozy finish, this skirt is incredibly warm – like being wrapped in a blanket – yet with a light and manageable weight. I really don’t know how I made it through the winters before without this skirt! Making the skirt was a bit frustrating for as simple as it was because it ran so very small! Most of the time patterns outside of the “Big Four” (Simplicity, Vogue, McCall, Butterick) tend to run on the larger side with a few random ones being true to size. Not this Advance pattern! I even graded up so it should have been slightly roomy on me, but no – it turned out mysteriously too snug. Luckily, I had extra room to give myself by letting out the side seam allowances as far as possible for the perfect fit. However, I would have preferred not to have to do that because there’s now no leeway if I need more room yet. I suppose it was a good thing after all that I did not use the suit jacket half of the same pattern because it could’ve run on the smaller side as well. I do see a good number of these Advance #3964 patterns for sale all over Etsy, Ebay, and various other pattern market sites, so if you pick one up for yourself, you’ve been warned about the sizing. Sorry, but if you would like to see the “Escape in the Fog” movie for yourself, it is frustratingly hard to find. I just happened to get lucky and catch it on our local station which shows old classics. For being a movie from 1945, it is rather like one of the early pioneers of the Film Nor genre which hit its height post WWII. However foggy and dreary my suit is in color, it is certainly not bland but useful and exciting to me. Actually, it is only the beginning of a small spell of suits that I have lined up for the next few months, most of them from the 1940’s. Will you be joining in on this suit trend, too? For me, it’s pretty much an excuse to make some of what has been languishing in my want-to-do project queue! 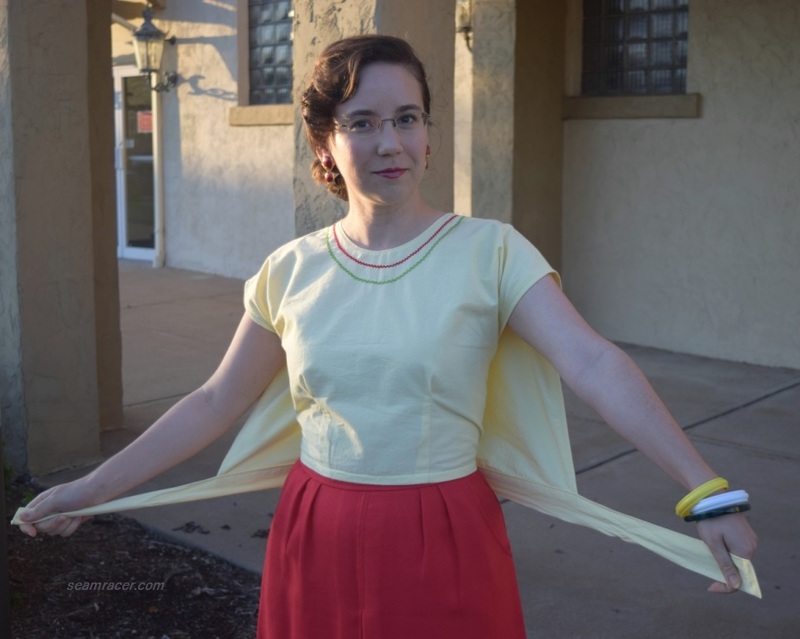 This weekend (May 5th, actually) marks the celebration of Cinco de Mayo, and I have made a 1945 wrap-on blouse to wear for the occasion. The 1940’s had a fascination for Mexico (due in part to the Good Neighbor policy), often using stereotypical prints on blouses, aprons, and skirts. 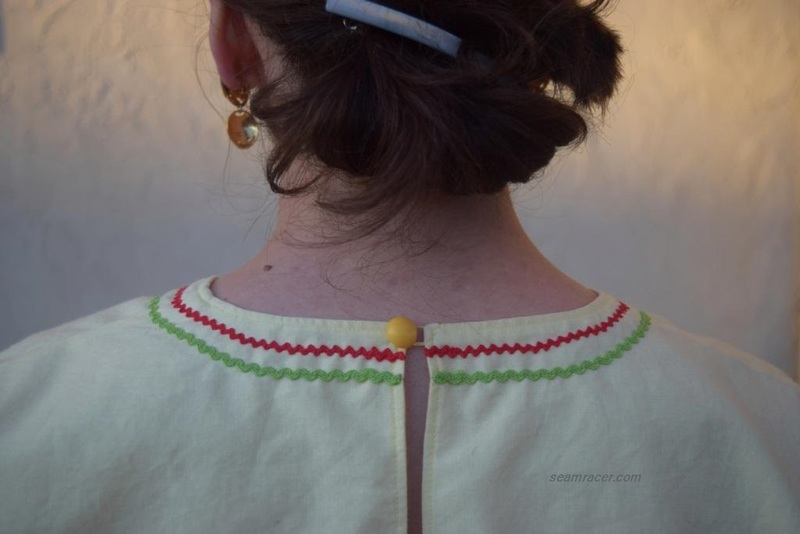 Here, my blouse only quietly nods to Mexican culture through colors and decorative rick-rack. Every year, I see tasteless Cinco de Mayo pictures, store sales, and meals that have no intention of being respectful and it angers me. I like to have the opportunity to learn more about different cultures, their history, their traditions, their clothing, and celebrate with them the right way. 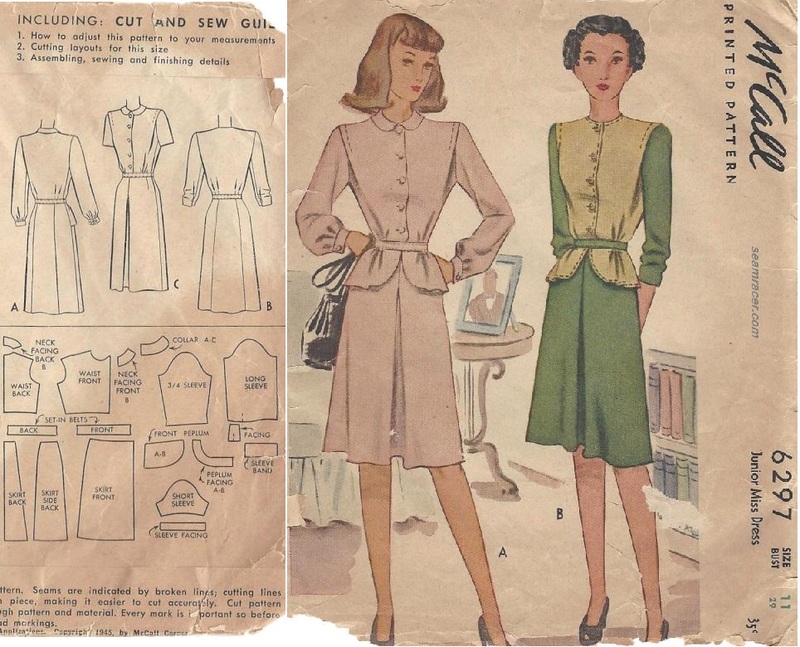 If I can do all of that by sewing a vintage pattern, then I have succeed in my aim. In case you were wondering, my blouse becomes an outfit thanks to a 1980s-does-1940s skirt, my Grandma’s vintage earrings, and modern 40’s style Worishofer wedge sandals. NOTIONS: I had on hand all the thread, bias tape, and ¼ inch elastic scraps that I needed to make this blouse. The neckline’s baby rick rack half vintage – the green is a recent Jo Ann’s Fabric store find while the red is a slightly smaller width and is true vintage. My back closure ball button is also vintage from my Grandma. TIME TO COMPLETE: This was completed on May 5, 2017, after spending maybe 5 hours in total. This blouse was a fun, simple, and different little project that came together quite well. 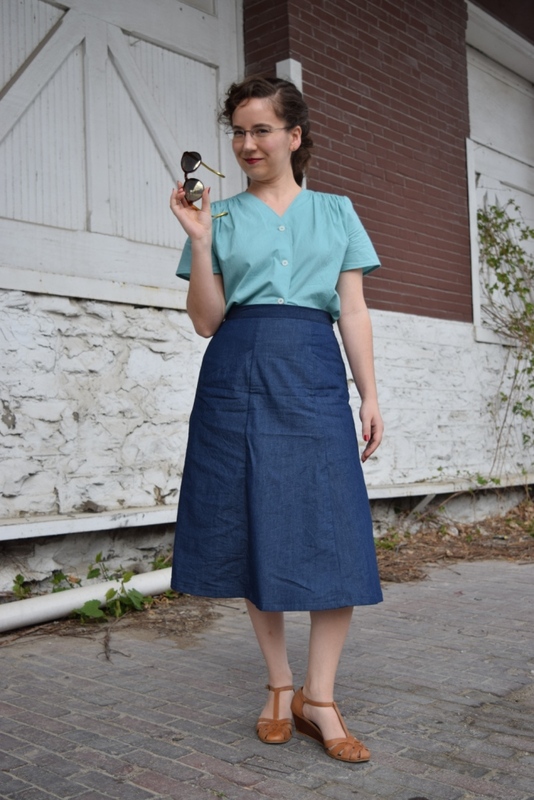 It is seriously so awesome, easy, comfy and cute that I think every one of you vintage and non-vintage gals would love this. I’m even considering somehow coming up with a PDF of my pattern to share on my blog at some point, because I know I now feel an unrealistic ‘need’ for about half a dozen of these wrap-and-go blouses in my wardrobe. I do not think this blouse looks like an obvious wrap-on top. I also think it fits remarkably well for as basic and squared off that the garment looks on a hangar. 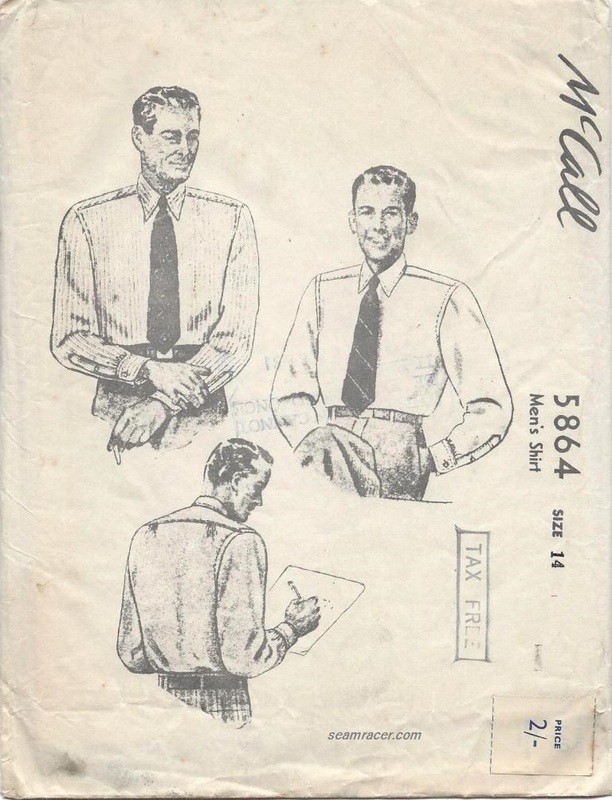 This basic design was apparently in a year 1945 LIFE magazine article on easy wrapped clothing to sew, and obviously (and smartly) Simplicity pattern company jumped on board. At first you might question whether a pattern for something so simple is necessary, I know I did! However, Simplicity #1412, not only has killer accessories to boot, but the top does has lovely bust darts, a curve in the back half of the wrap, and shaped shoulder seams. It might look like a square, but I believe those subtle added shaping details add so much more to the success of such a top than a basic drafted square ever could. My pattern is a medium, which turns out is the perfect size for me. This fitting designation is unique. 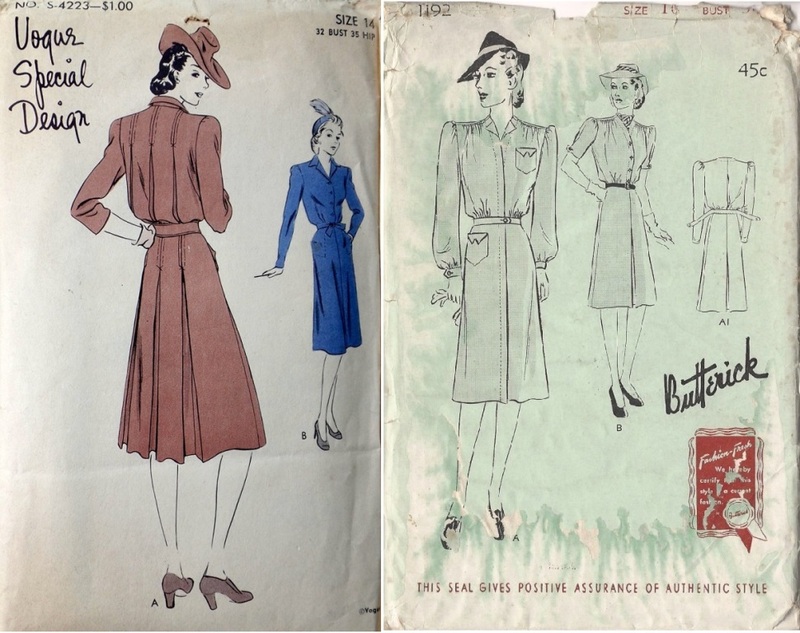 Usually vintage patterns tend to go by numbers for their sizing and not “small-medium-large”. According to this size rage chart for the medium I should have technically been fitting into a small. No – I think going up a size gave me enough extra wrap-around room without being too much. 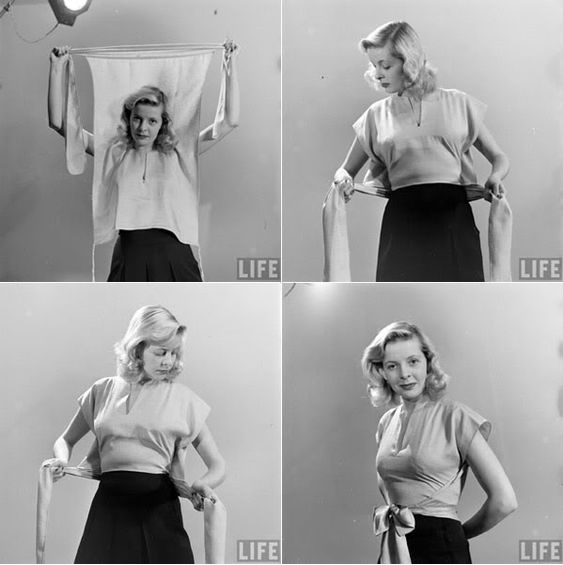 Having a wrap-on top makes fitting not as cut-and-dry as a ‘normal’ blouse! 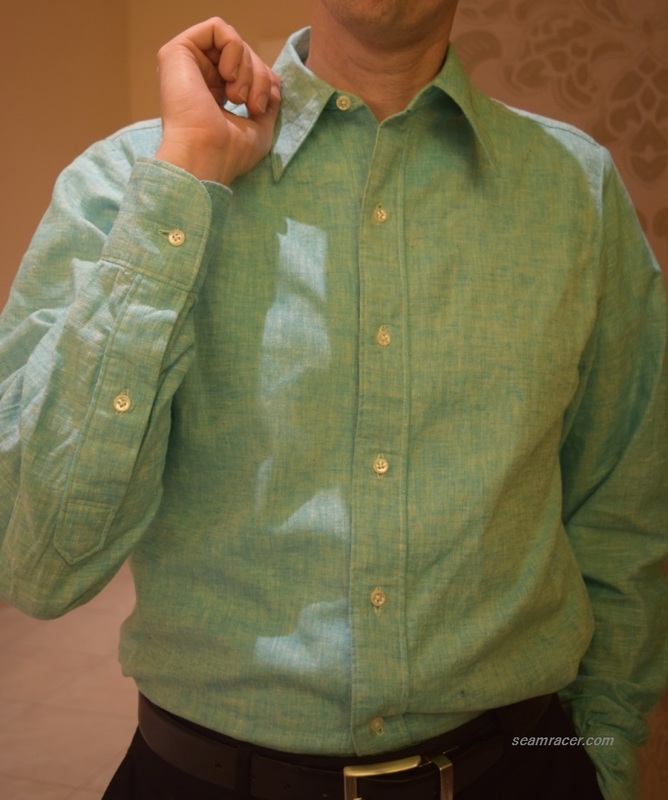 There were a number of changes that I made to the blouse which greatly add to its finished success. Firstly, I doubled up on the layers to eliminate any see-through issues and the need for fiddly facings around the neck. 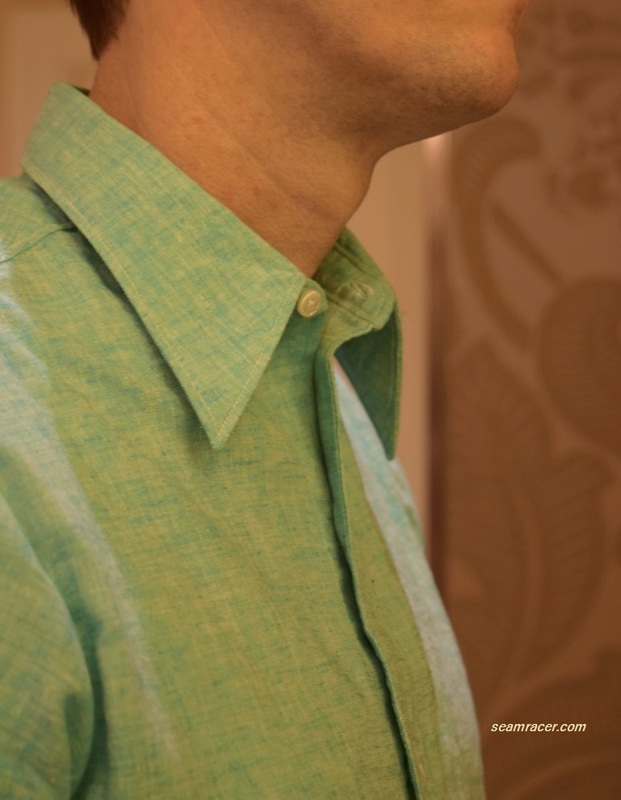 In other words, I cut and sewed two tops – stitched only at the shoulder seams – then sewed them (right sides together) at the neckline, snipped, trimmed, and turned right sides out so as to top-stitch the neckline down. Then I reached underneath and sewed the outer sleeve edges from inside out so there would be no visible seams. Secondly, I cut the back tie on fold eliminating a vertical center seam. Thirdly, the back waist tie (which closes in the front) was supposed to be a single layer but I folded it in half and sewed it just like a casing to cover all the rest of the seams and make the waistband smaller for my shorter frame. In other words, it’s half the width the pattern planned it to be. Fourth, I lowered the high, almost choking-high neckline by 1 ½ inches. Fifth comes the most important adaptation of all – the ties which attach to the front panel. Not to blatantly pat myself on the back, but the way I made them makes this blouse truly work, so I will explain in detail. The pattern calls for ties on either end of the turned under hem to the front bodice panel. With just these ties, the blouse cannot be worn by itself – the arm openings gape too much…I would’ve needed an extra tank or camisole top underneath. Besides, a regular tie would just be uncomfortable to get snug. So – my answer is two-fold. Six inches up from the bottom hem is another set of ties keeping the arm openings closing higher to cover my lingerie. Also, my blouse’s ties are skinny bias strings attached to a 3 inch remnant of ¼ inch elastic. The elastic end is sewn to the blouses’ side edge so when I tie the strings behind my back they have a very comfy ‘give’ that is not confining. This elastic especially comes in handy with the upper ties! I can stretch, and my blouse stays closed, but stretches with me. A plain old bias ties would not be this forgiving. I know I am lacking one color of rick-rack for my neckline trim to be the colors of the Mexican flag, but I was going for tasteful, ascetically pleasing, and symbolical all at the same time. Some informational sites say that the red color was originally intended to represent unity with Europe. I’ve also read that the red represents the Spaniards that joined in the quest for Independence as well as the blood of the national heroes shed for Mexico’s liberty. The green stands for hope, independence, and nationalism. My cheery yellow top underneath pays homage to Mexico’s traditional culture of the sun – from the sun comes positive energy and life, and “Tonathiuh” is often given the highest honors in festivals and traditions. Yellow is also the color of corn or “maize”, not just a crop but a deep cultural symbol intrinsic to daily life and in ancient times revered as “what the gods had chosen to create to feed mankind”. 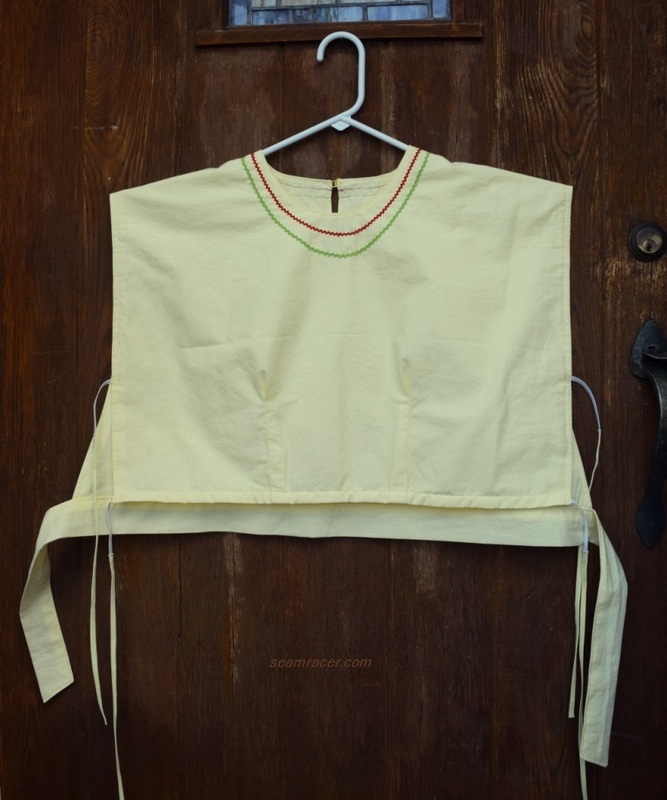 Of course, on a practical sewing level, I was also inspired by this vintage Simplicity #4440, a circa 1942 apron pattern with its two-color rick-rack on yellow. However, researching the color meanings to my Mexicali top helps me better realize just some of what they are celebrating this weekend. My title is named after one of my favorite classic “ranchero” western songs. 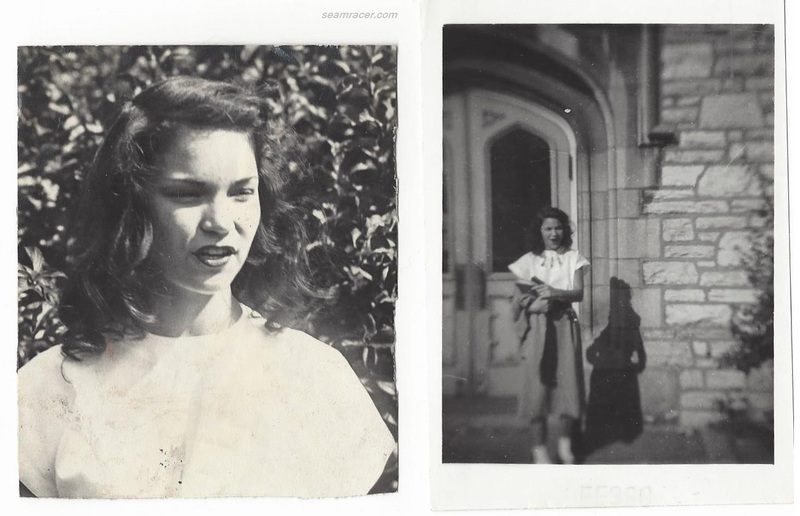 “South of the Border, Down Mexico Way” from 1939 is a lovely song that I remember my dad singing “…manyana…” along to the refrain as he would listen to his recordings of WWII and pre-war tunes. No wonder it makes me happy and peaceful even though it is an intrinsically sad song. I had to have it as my title…it makes me think of all the best of what I picture Mexico to be, even though I haven’t been there. I think I reached my goal of understanding Cinco de Mayo better this year than before thanks to making my blouse and typing this post. 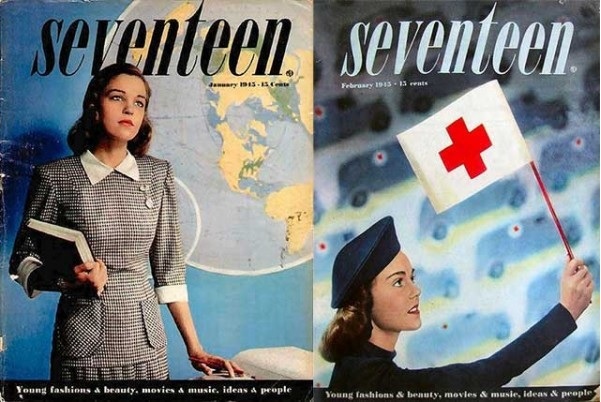 I will not bore you with all the related history I would love to share, and for now just hope I gave you enough inspiration and eye candy, with a little sharing of my research, to make your day. Interested? 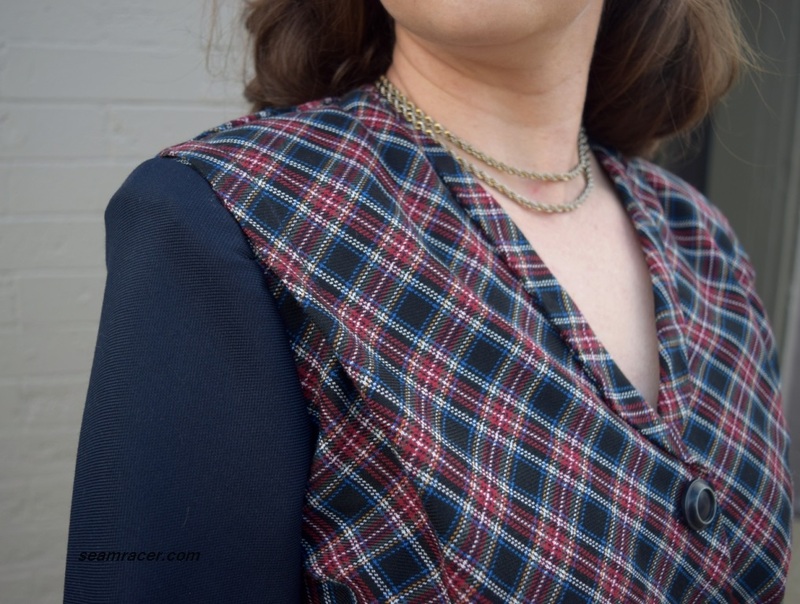 Basically, using two mid 1940’s patterns, I drafted a mixed-breed WWII era blouse only to add some beautiful features to it and make it not 1940’s at all just so I can imitate Marvel’s Agent Carter. 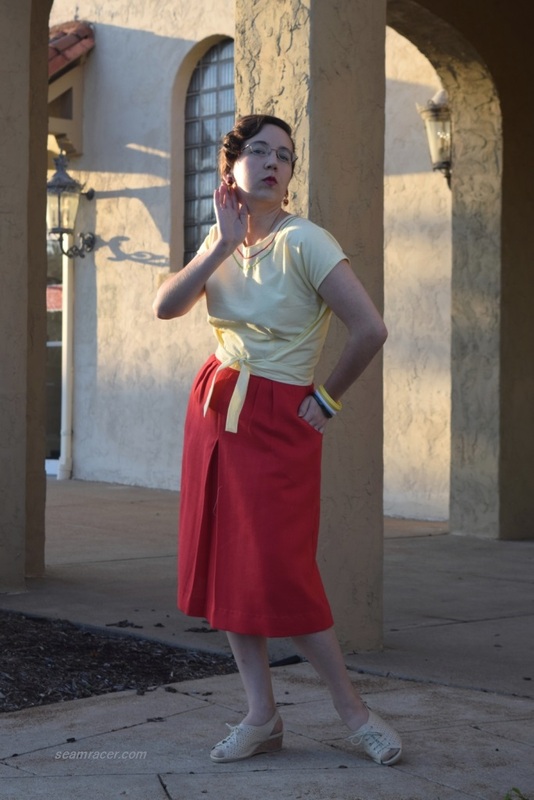 My skirt is completely modern with timeless features which co-ordinate perfectly with current or 1940’s dressing styles. I’m absolutely loving the versatility and comfort of my blouse and skirt! From a historical standpoint, you might say I had misdirected principles here…although I’m not too far off in accuracy. However, being creative and having fun is to me one of the most important factors to sewing for myself or anyone else…enjoying yourself! 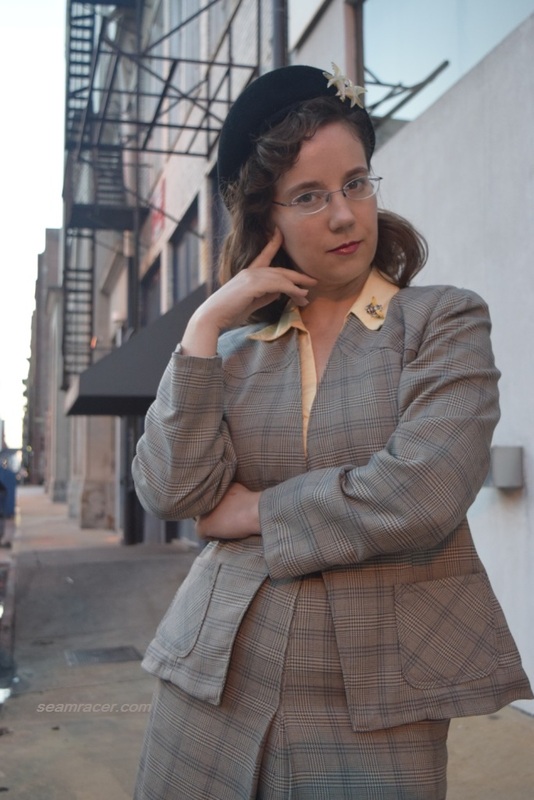 I also am one of Agent Peggy Carter’s biggest fans, and I am more than happy to rock what she wears, too. So – here’s to enjoying my own style “a la Carter”! FABRIC: The blouse: a thick and luxuriously soft 100% cotton. It is a line of U.S.A. made “Country Classics” cottons available at JoAnn’s Fabrics. 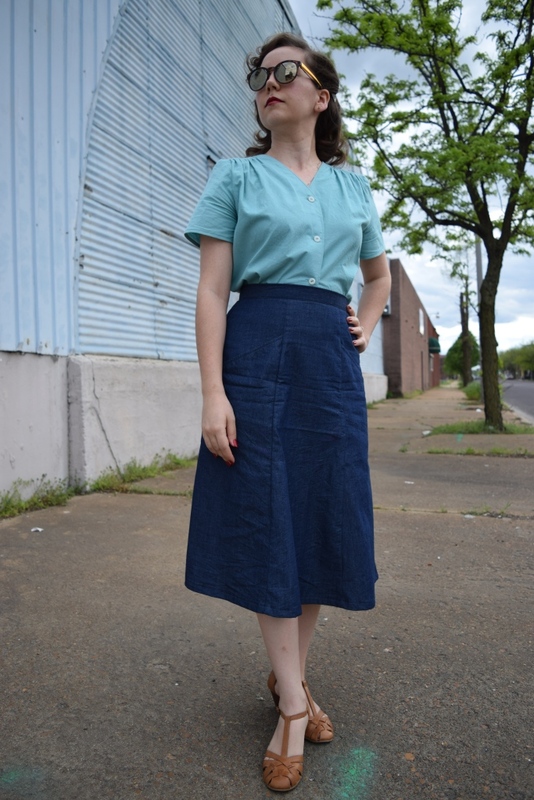 The Skirt: a 100% cotton lightweight indigo wash denim…so nice it doesn’t really look like denim. NOTIONS: None but thread and a little interfacing was needed for both projects and these notions were on hand, as well as a zipper, hook-and-eye, and vintage buttons from hubby’s Grandmother’s collection. TIME TO COMPLETE: The blouse was done quicker than the blink of an eye in one afternoon and evening of 5 hours on March 14, 2016. The skirt was made in about 5 hours and finished on April 13, 2016. THE INSIDES: Nice! All seams on both the skirt and blouse (except for the armhole/sleeve seam) are finished in French seams. TOTAL COST: On sale with an extra coupon, my blouse’s American fabric (being the only cost) was about $5.00 for one and a half yard. 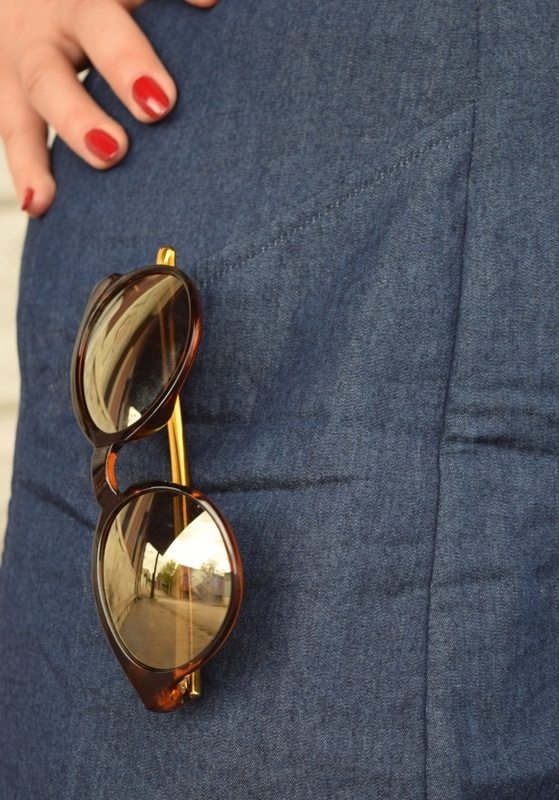 My skirt’s denim cost about $10. 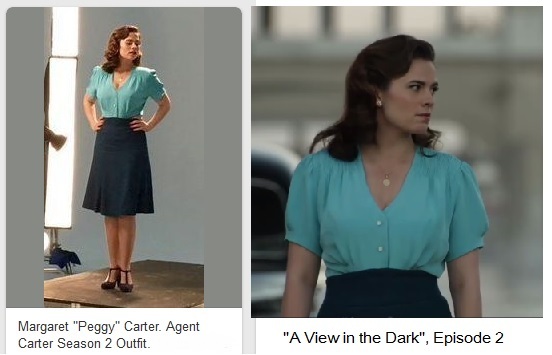 Happily, our new cable provider has given us the option of being able to record HD channels on TV, and we’ve taken advantage of this to have the whole “Agent Carter” season 2 recorded so we could watch it (and I could study the fashions) all we wanted. 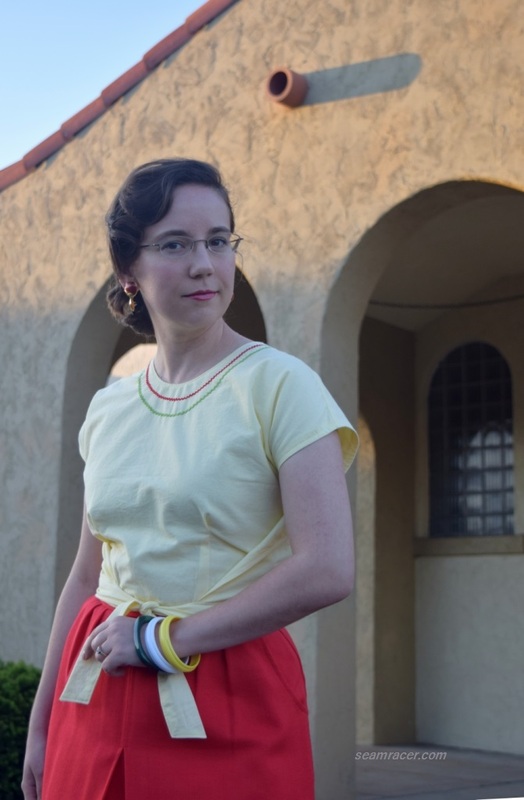 After much pausing, playing, and rewinding, I figured out the details of my chosen-to-imitate blouse and skirt from Episode 2, “A View in the Dark”. First off, Peggy’s blouse is most definitely a much finer material than my own – it’s probably silk or at least a very fine rayon by having such a soft shine and lovely drape. 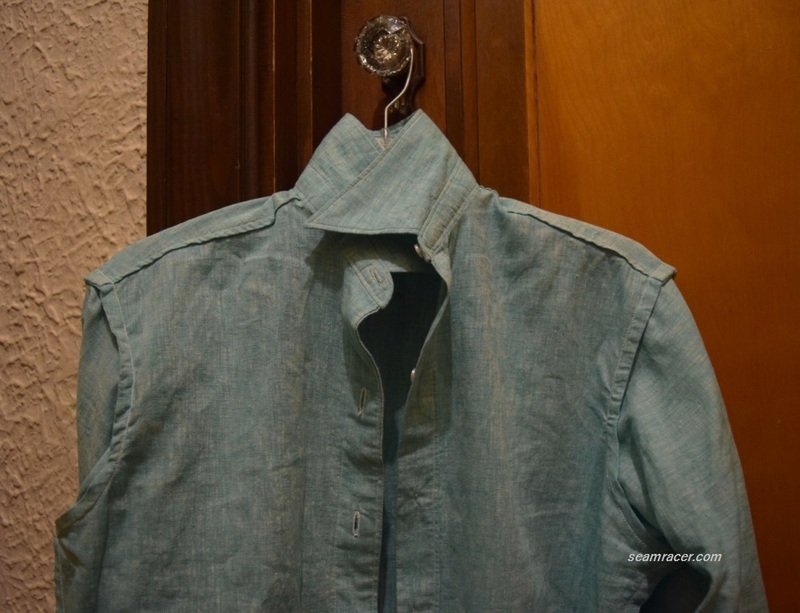 Secondly, her blouse has several rows of ruching or shirring across the upper shoulders, with a V-neck and three squared buttons which looked like shell. 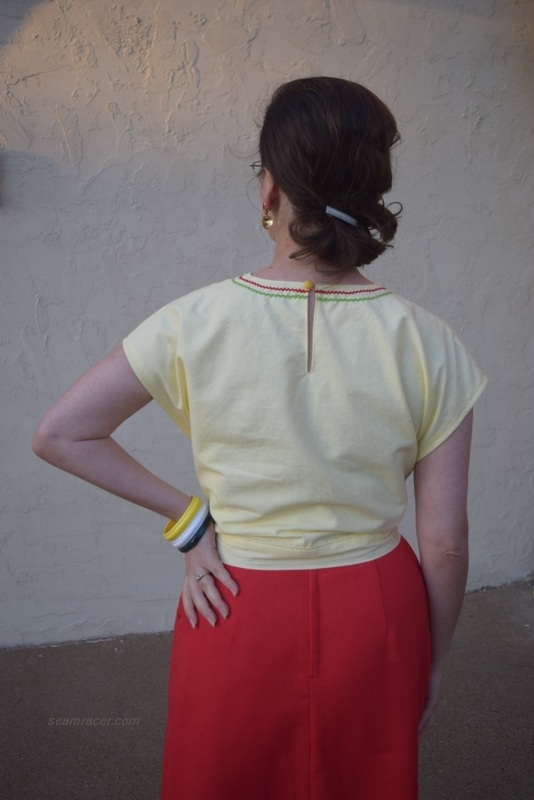 The back of her blouse has an upper shoulder yoke with a lower bodice section with has about three or four pleats coming out from under the yoke. The sleeves are puffed with a small box pleat at the center bottom hem. 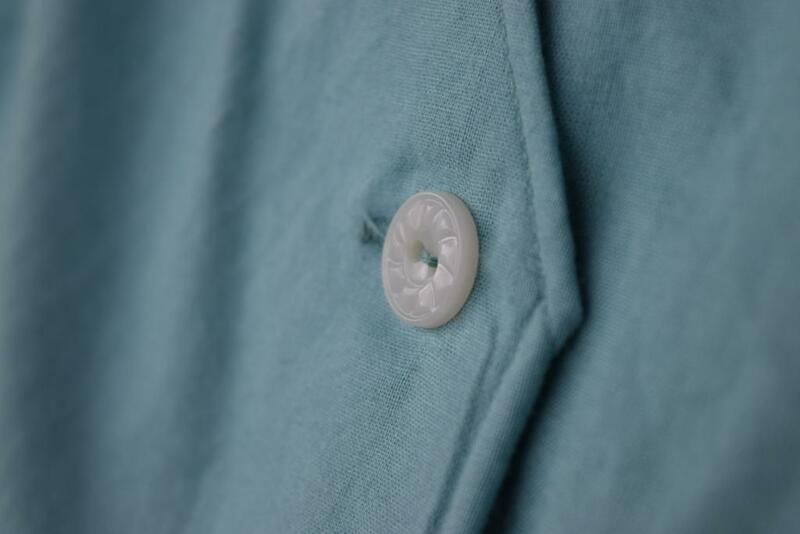 The color my blouse and Peggy’s is pretty much exact – a soft aqua tinted baby blue. Now her skirt looks like it has six-gores, with bias flared bottom and hip shaping. The waist is high and arched in the front over the belly. The material is nicely flowing…just lovely details in all, enough said. 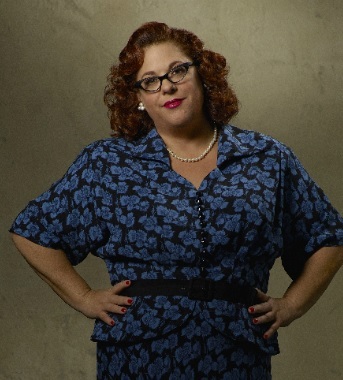 Now, as much as enjoy being in Peggy Carter’s shoes I still need to stay “me”. Thus, I downgraded in materials from rayon or silks, which probably were the fabrics of the originals, to cottons and denim so my look-alike outfit is completely practical for my life. 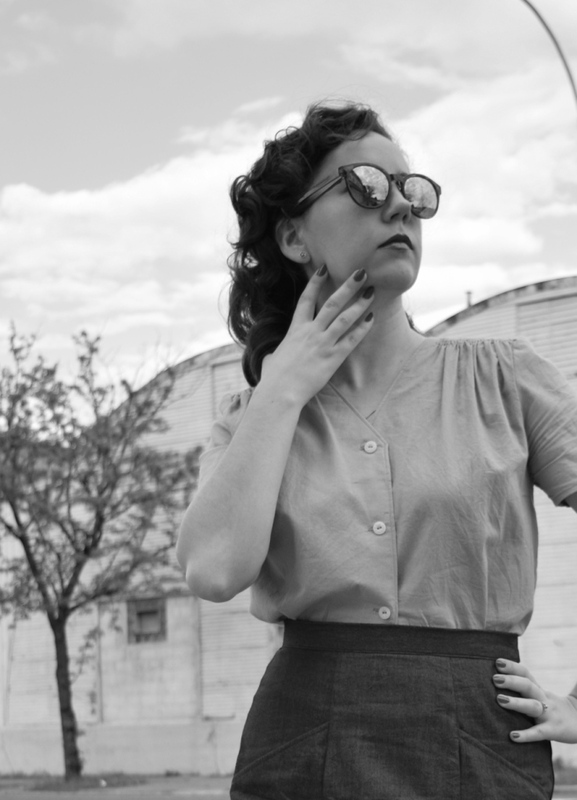 Vintage styles are so good for offering luxury that is classy and put-together with the comfort of modern lazy-day clothes. 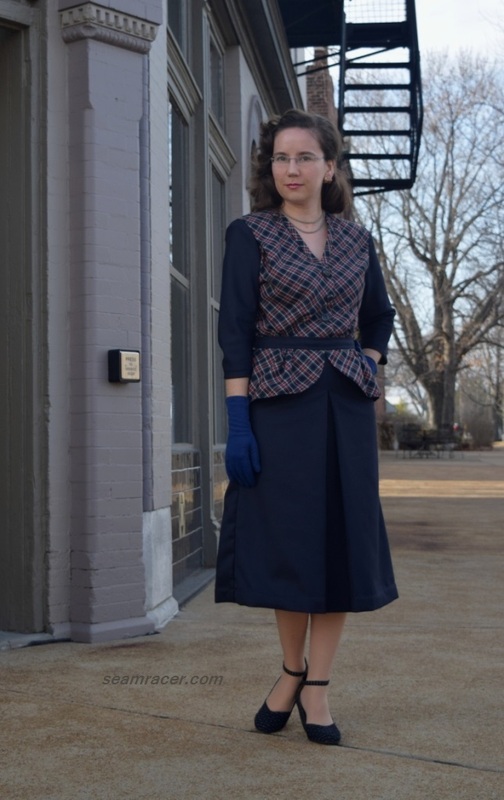 The blouse is a combo of two patterns which I previously made with great success (posts here and here) and they are one year apart (’44 and ’45) so I felt confident that this could not go wrong with this mash-up. To start, I overlaid one pattern over/on top of the other so as to make my own design from there. I wanted the main body to me more or less like the Hollywood pattern in overall length and hip width, while the bodice of the McCall dress pattern was my guide for the V-neck and the shoulder gathers (shirring or ruching as it’s called). 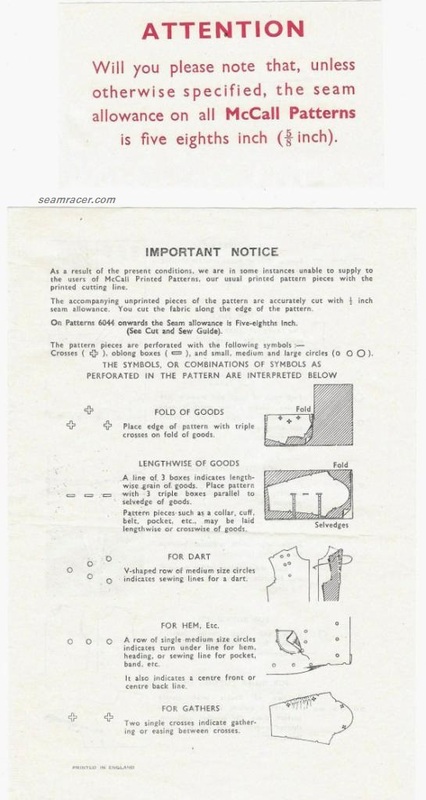 The most challenging part was to try and define a set-in shoulder seam on the McCall pattern as the sleeves are a continuous part of the dress in the original design. 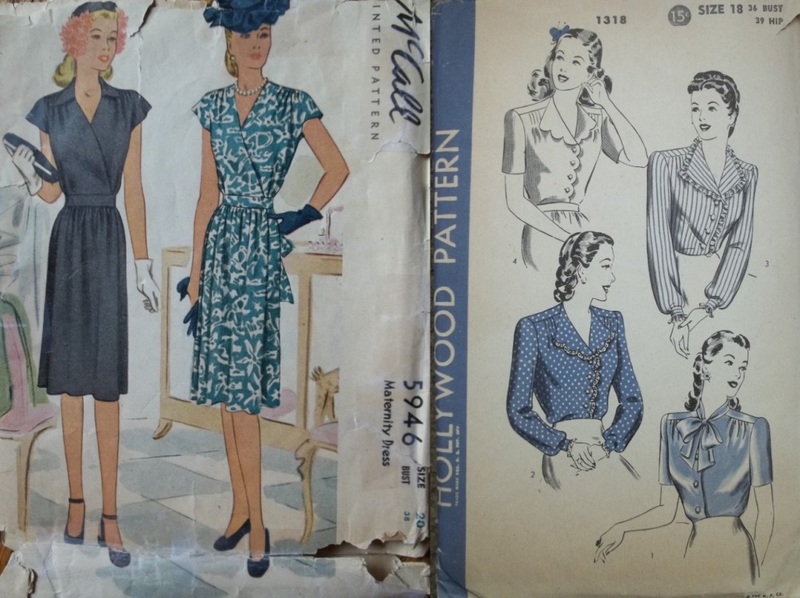 The sleeves for my “Agent Carter” blouse came from the Hollywood pattern as I knew they were loose and comfy. Halfway down the shoulder seam of the back bodice, I drew a line for a shoulder yoke above the line and a detailed lower half. For the lower back bodice, rather than cutting on the fold I made a center seam and added about 3 inches in a parallel block extending down the center back so I could do a box pleat. I’d say my blouse is a success. There are lovely details in both the front and back, so any way you look at it, the blouse is pleasingly detailed. 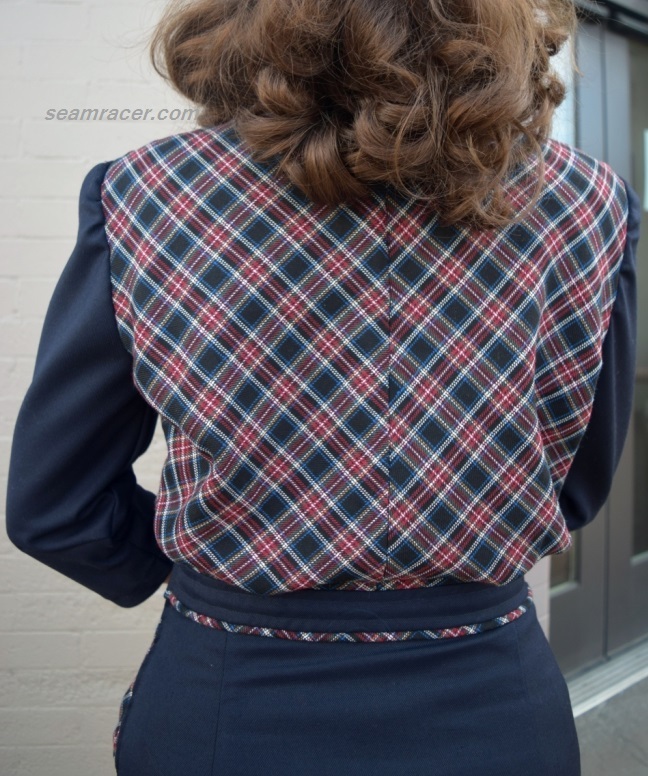 The back box pleat gives me comfortable reach room and adds a masculine touch while the front has a complimentary V-neck and delicate shirring (8 rows of it) for a ladylike touch – a mix of both worlds…much like the life of Peggy Carter. 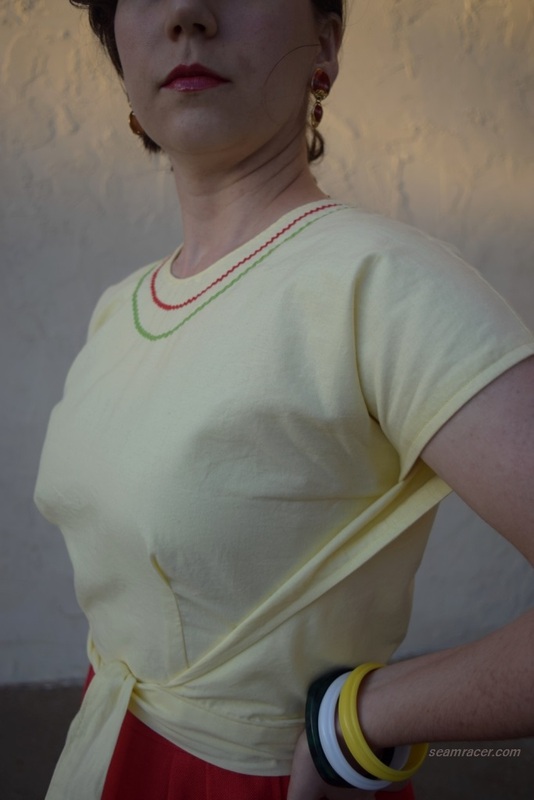 There is a similar blouse pattern from Burda Style, sans shirring and with a collar, for a lovely “as-is” option to making your own Peggy Carter blouse. Now, I am a bit confused though because her blouse that I imitated here is from a TV series which supposedly takes place in 1947, but everything about this blouse is late 1930’s or early 40’s. 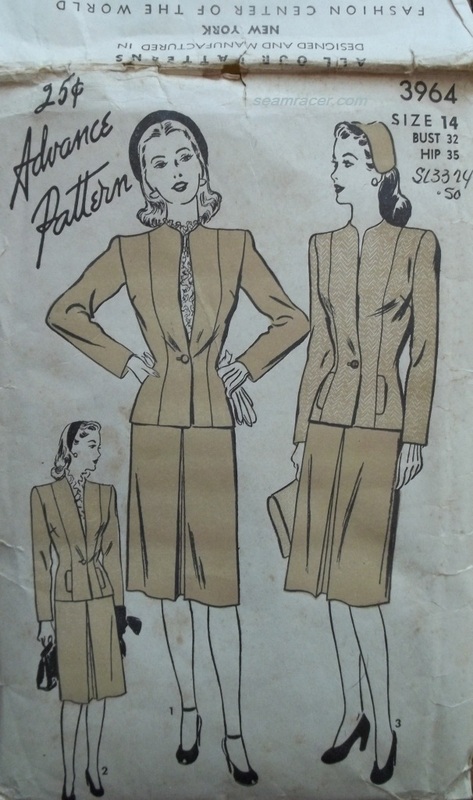 I have found images of patterns with box pleats in the back bodice but they were from the late 1930’s or very early 1940’s, and the same goes for opulent shirring except it started early on in the 30’s. 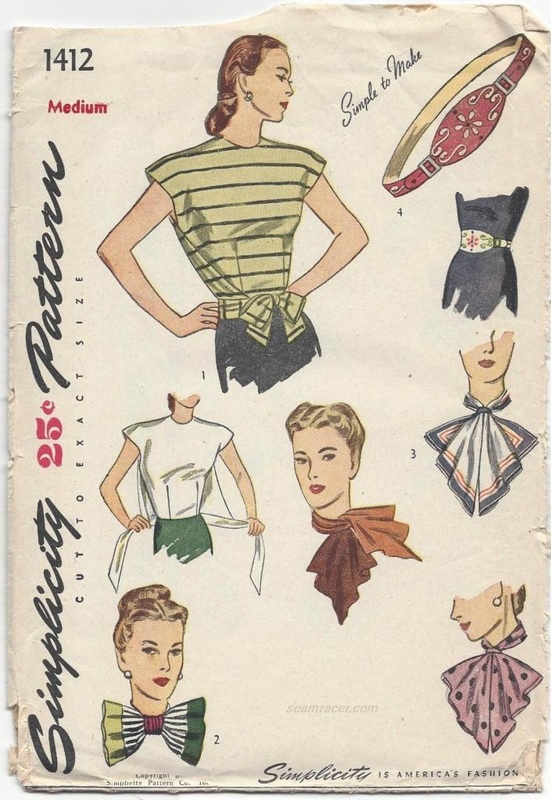 So my blouse is actually accurate, just a more or less mystery year as Peggy wore this in 1947 and I used ’44 and ’45 patterns to make a blouse for a period much earlier. Oh well, it fits, it’s comfy, so versatile, and completely makes me happy! My skirt was super easy to make and is equally awesome as the blouse, I must say! 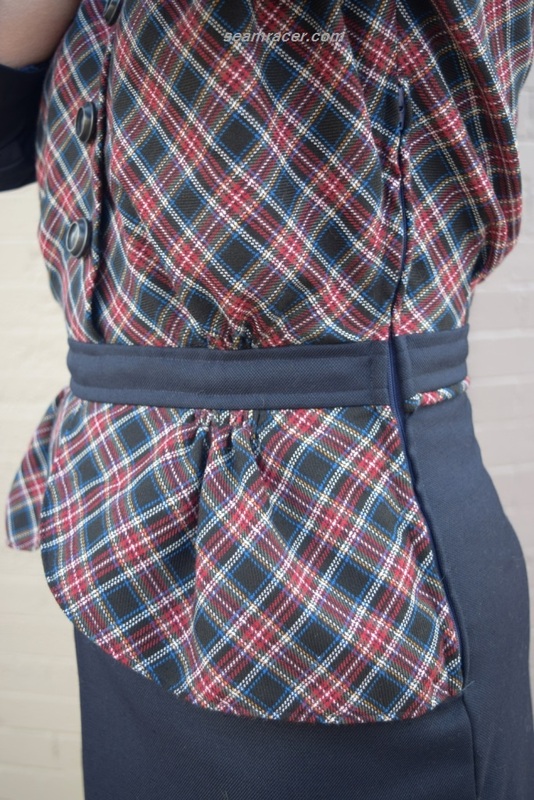 With the skirt being so simple, I spent the extra time to make fine finishing inside and to re-draft for some lovely generous pockets…a handy must! 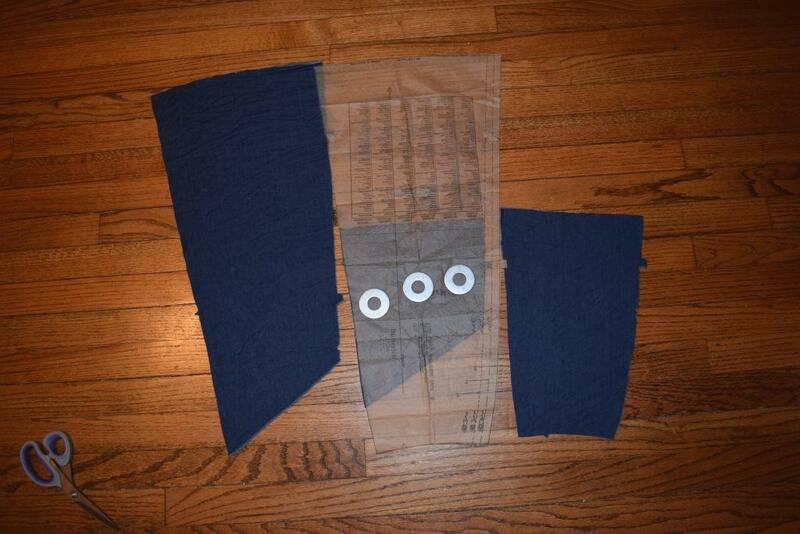 Yes, the pockets were not a part of the original design, but were easy to add into the side front panels. I simply drew in the pockets were I wanted them to go, added in the seam allowances, and cut the side front panels into three portions instead of one (an upper pocket panel, the pocket itself, and the lower skirt panel). The pocket upper edges go at an upward angle toward the middle panel and are re-enforced with seam tape while in the stitching process to prevent any stretching. I also added 2 inches the length of the pattern to get a skirt which has better total knee coverage (and make it more mid to late 40’s). 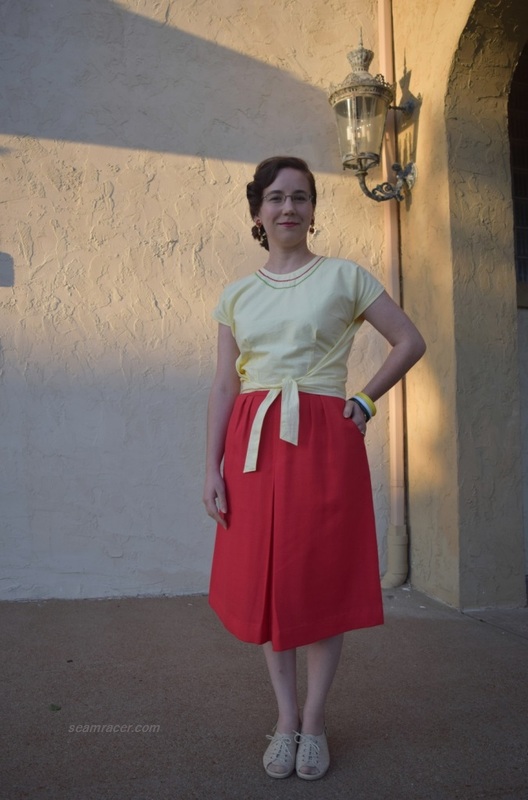 Originally wanted a closer fitting skirt with a flared bottom (like Peggy’s and like “Physics Girl’s” Simplicity 2451 skirt). 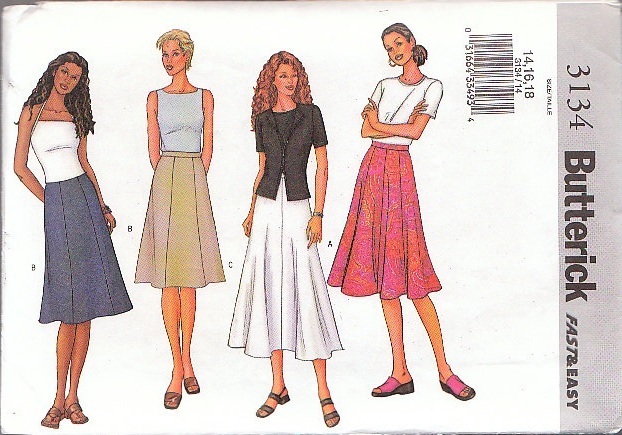 I was really considering using a Simplicity #4086 (out-of-print, year 2006) from my stash, but I wanted my skirt to actually sit at the waist and not the hip like the other patterns I was considering. The pattern I used is also more classic and easy to move in with an A-line silhouette that changes to a fitted flare appearance as I move or as the wind blows. Here is a link to my favorite version and best review for the skirt pattern, this is what really sold me on this out-of-print gem. 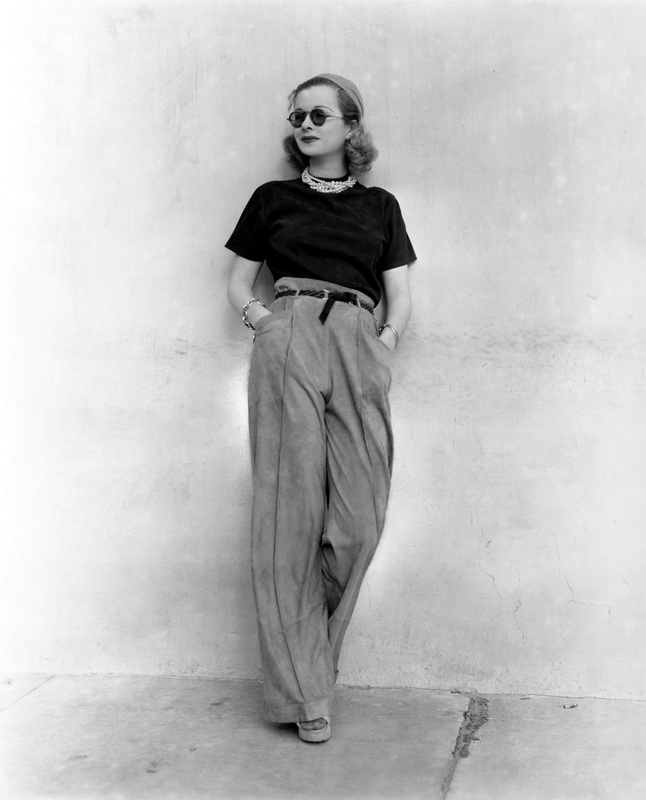 My inspiration for adding in the pockets, besides utility and practicality, came from a combo of the pattern “Physics girl” used and this picture of actress Joan Bennet. I went all out with my Agent Carter fandom and was wearing her “Red Velvet” lipstick from Beseme Cosmetics and “Cinnamon Sweet” nail color from OPI. I can’t say enough good things about both products so I’ll just say they are wonderful. OPI nail polish is deep color, with a great brush and long wearing. Sometimes with a nice top coat I get a week out of my OPI colors and they self-heal with a touch-up over small chips. The Beseme lipstick is thick and rich and also long lasting – the best ever! Some factories from the old industrial district of our town, the Carondelet neighborhood, became the backdrop. I was trying to re-create the feel of Peggy visiting the Isodyne Factory in the episode where she wears my inspiration outfit. The blue factory is an authentic Post WWII building and the lovely sky was trying to match me in tone, too. Even buildings meant for basic or industrial uses can have their own special rugged beauty in my eyes. We had fun with this photo shoot so look for more of these Carter inspired pictures on my Flickr page soon. I hope this post inspires you to try that adventurous mash-up of patterns so you can wear that lovely inspiration outfit that strikes your fancy. Every “franken-pattern” I do has some sort of frustration, disappointment, and confusion – but see what you can get when you don’t give up! Put your own personal touch to it, enjoy the experience, and give it a go! This is the best examples of one of the reasons for sewing – making a one-of-a-kind garment which is exactly what you wanted to wear.